Ensuring your septic system is clean enough for a Home Sale Inspection is very important to getting your house on and off the market. The task is surrounded by government, state and local requirements in order to sell your house, and Waters Vacuum Truck Service can handle all your needs. We are able to satisfy all mortgage lenders’ needs while maintaining county and city ordinances in Reno, Sparks, Carson City and the surrounding Truckee Meadows. 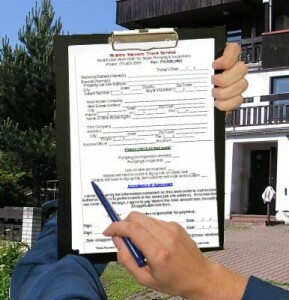 If you’re looking to sell your property you will be safe in the septic department with us! Unlike our competitors, Waters Vacuum Truck Service offers billing through escrow for all services required to close a real estate sale, without the escrow fees some other vendors charge. When inspecting we hydro-clean all chambers of the tank and perform a hydro-static check on the leach field.